Santo Domingo potter Robert Tenorio has painted this polycrome pot with beautiful geometric patterns. 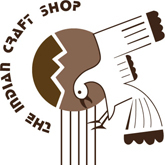 Contemporary American Indian pottery is the legacy of a tradition thousands of years old. To be considered a "traditional" piece of pottery the potter must dig the clay out of the ground and construct the pot entirely by hand without the use of a potter's wheel. Many traditional potters eschew the use of electric kilns for firing their work, instead using an outdoor pit fueled by wood and dung. 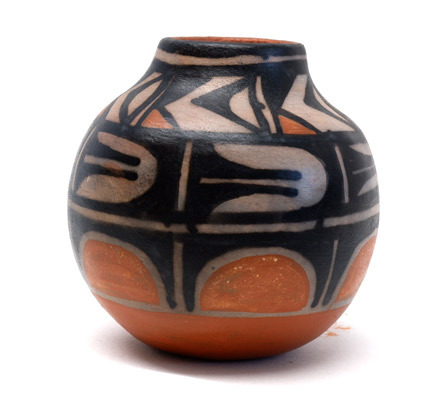 Designs are either carved or scratched into the surface of a dried piece before it is fired. Designs can also be applied with a "slip", a thin mixture of water and clay. Different clays, ground minerals, or plant materials are used to make slips of different colors. 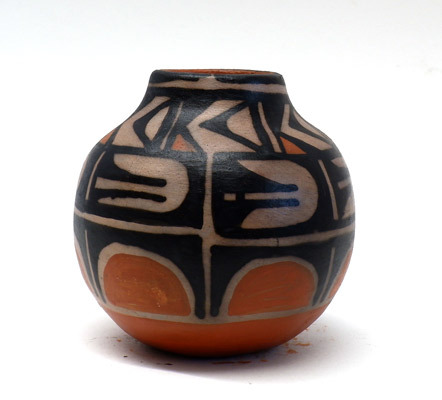 Many Navajo potters coat their pieces with pine pitch, which gives them a lustrous finish. 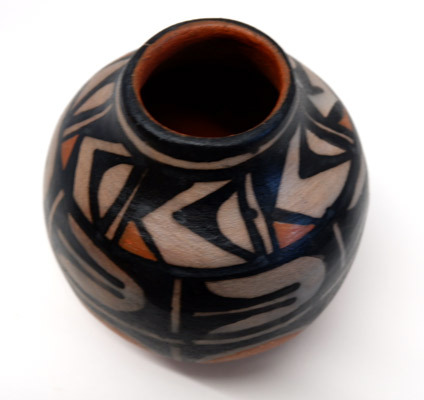 No glaze is ever used in traditional American Indian pottery. Pottery with a shiny finish has been polished by rubbing the surface of the piece with smooth stones. Often a single piece will incorporate several of these techniques.